[Akhil] and his wife recently finished their WakeUp Light project. As the name suggests, this kind of morning alarm uses light to wake you up in the morning. The main constraints when starting this relationship-strengthening adventure were cost, ability to work with any table lamp, and having a simple but effective control interface, all while keeping all the design open. The created platform (put in the wooden box shown above) is built around a Stellaris Launchpad (ARM Cortex M4 based) and uses an AC dimmer circuit found in this instructable. For our readers interested in those, [Akhil] mentions two very interesting articles about their theory of operation here and here. An Android application has been made to set up all the alarm parameters, which uses the phone’s Bluetooth to communicate with the (well-known) HC-05 Bluetooth transceiver connected to the Launchpad. For safety, the current design also includes an LM4876 based audio amplifier connected to the microcontroller’s PWM output. The next revision will integrate a Digital to Analog Converter and an SD-Card slot for better quality and music diversity. A presentation video is embedded after the break and you can find the official repository at GitHub. Add a truck horn just in case! You know an IT bubble is about to pop when everyone, even your wife is making ‘apps’. Sexism just called. They want their gender-roles back. Isn’t it great that APIs are getting (a bit) easier to learn? Everyone should be able to make apps. That said, my wife is engineering machines that reach nanometer precision. Way back in the early 70’s I made a motor dimmer wake up for a floodlight aimed up in the room. It was a nice way to wake up when I had to get up at 6 AM. 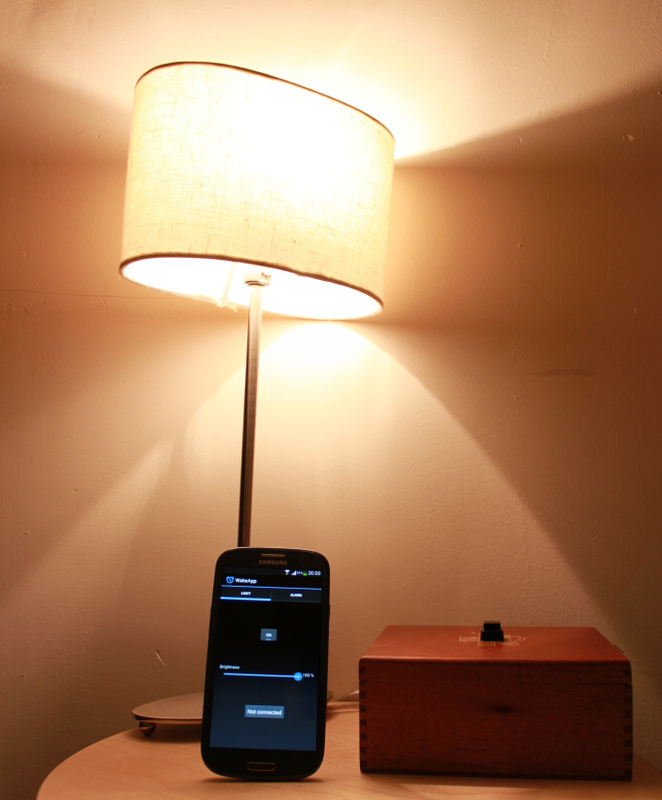 A timer now turns on the whole house audio with NPR. Something to add to this project is a simple relay for powering up a real audio setup not another annoying sounder. Erm… it’s MORNING – why not just use daylight to wake you up???? We live in the Netherlands, its always cloudy here. Its still dark when I leave for work for most of the year. Same here in my State in the U.S. I am half way through my day before the sun comes up. I’ll second that. I still can’t get used to January here in the Netherlands. ‘Daylight’ doesn’t usually start until nearly 9:30 am, and it can be even worse if it’s cloudy and overcast (which is almost every day). I live in Sydney, Australia. Even here when it isn’t cloudy it’s still dark at 6am for most of Winter and when Daylight savings time changes over. 6am isn’t an unreasonable time for a 9-5 worker to get up. Gives enough time to walk the dog, have breakfast and prepare lunch before leaving. My belief is that if you need an alarm you aren’t getting enough sleep, tired people do not perform well. [garym53] you’re forgetting one thing: Scientists and engineers don’t sleep. Because the time daylight starts changes from day to day? Not helpful when you need to wake up for work. What do you do when the state declares a time change, yet alone the less equatorial we live there is a seasonal cycle variation that ignores civilization. I could use a timer driven blind to introduce me to my day. NASA uses dimming and blueish daytime and redder towards “night” colour control for lighting on the space station to make the people adjust to a human cycle in the ’round the world in 90 minutes’ they orbit. Experts say to dim the lights and kill the screens about 2 hours before bedtime to promote serotonin and restfulness to those plagued by not enough sleep. Hence those who need truck horns and air-raid sirens. Look up Victory Siren for sound bites of a Hemi powered noisemaker if you need it. the idea of ​​combining the strange devices linked together so creative, I love this post. I just need to a lamp to turn on dim and gradually brighten over the next few minutes. I have an old Radio Shack alarm clock with a timed outlet on the back, so I just need to build a self dimming (brightening) circuit/program. Ok, now you’ll are going to make me complete my 1000 Watt High Pressure Sodium wake up system….. now that’s a wake up lamp.